Nothing ensures a recipe's success as much as using farm-fresh ingredients. 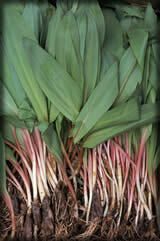 Ramps are pictured above. In a small saucepan, stir together the lemon zest, juice, water, and sugar. Bring to a boil, uncovered over medium heat and boil for two minutes. Strain the syrup into a bowl. Finely chop two tablespoons of the cooked zest and add it to the syrup. Chill the syrup thoroughly. Stir the cream into the syrup and freeze in an ice cream maker according to manufacturer’s instructions. In a large pot over medium-high heat, heat 2 tablespoons of oil and brown the meat about 5 minutes. Season the meat with salt, remove it to a plate and set aside. To the same pot, add the chopped onions and whole cloves of garlic and turn the heat to medium. Cook until onions are tender and garlic lightly browned, about 5 minutes, stirring occasionally. Return the meat and its juices to the pot and add one chipotle, the smoked tomatoes, and one cup of water. Turn heat to low and simmer covered until meat is tender, 1-2 hours, adding more water as needed to keep a little sauce going. Meanwhile, place beans and the remaining chile in a pot with 4 cups of water. Bring water to boil, reduce heat to low and simmer beans covered until tender, 45-60 minutes. Add salt to taste, turn off heat, cover beans and set aside. Cook the greens in boiling salted water for 5-10 minutes (kale takes longer to cook than chard), drain and set aside. When the meat is tender, add the greens to the pot, and the beans along with some of their cooking liquid. Add sausage if desired. Cook over medium-low heat to blend flavors, about 15 minutes, adding more bean liquid as desired. Season to taste with salt. Serve with grilled thick slices of country bread. Peel and section 4 of the mandarins. Place them and the dates and arugula in a salad bowl. Toss with olive oil, salt and pepper, and the juice of remaining mandarin to taste. Shave cheese over salad and serve. Michele Scicolone is the author of Italian Holiday Cooking published by William Morrow. When I moved to the suburbs years ago, newcomers like me were jokingly advised not to leave our car windows open on a summer night. If we did, we should be prepared for the consequences. Some backyard gardener, blessed with too much of a good thing, might leave us an anonymous gifta sack full of overgrown zucchini. Personally, I can never have too many zucchini, as long as they are fresh, crisp and, most of all small. The best zucchini are glossy with bright skin and firm flesh. They smaller ones seem to have the most flavor too. Enormous zucchini make useful doorstops and win prizes at state fairs but are not very interesting for eating. When zucchini are at their best, you can count on the basil to be peaking too. One of my favorite summer soups is a simple version of pistou, a vegetable-based soup common along the French and Italian Rivieras. When I stir in a big helping of fresh pesto at the end, the hot soup releases the aromas of the garlic and basil, and their perfume fills the air. On hot summer days, I serve pistou warm, not hot, with a loaf of good bread. Or I use zucchini in a tian, a dish of sliced vegetables typical of Southern France. Some cooks finish the tian with eggs, making a kind of baked omelet, but I usually just sprinkle it with cheese. A tian is perfect for picnics too and even tastes good or better the next day. I have been making zucchini sticks sautéed with garlic and herbs for years as a side dish though lately I have found that it makes tasty bruschetta that I can serve as an appetizer or lunch dish. I also serve it with poached eggs and grilled sausages for brunch or toss it with some freshly cooked penne pasta for dinner. My final zucchini suggestions: a carpaccio that I serve as a salad, lunch or appetizer. The vegetables are sliced as thin as possible, about 1 millimeter thick, using a mandoline slicer or food processor and tossed with a dressing of fresh lemon juice and extra-virgin olive oil. Thin curls of Parmigiano Reggiano complete the dish. Armed with these recipes, you may want to risk leaving you car windows open at night. If you prefer a creamier soup, cool the soup slightly, then puree it in patches prior to serving. In a large pot over medium heat, heat the 3 tablespoons olive oil. Add the onions and cook, stirring occasionally, until softened and golden, about 15 minutes. Add the zucchini and potatoes and cook, stirring occasionally, for 10 minutes. Add the stock or broth and water, increase the heat to medium-high and bring the liquid to a simmer. Reduce the heat to medium-low and simmer, uncovered for 30 minutes. Season with salt and pepper to taste, add the spaghetti and simmer until the pasta is cooked through, about 10 minutes. Meanwhile in a food processor, process the garlic, basil and parsley until finely chopped. Add the cheese and pulse to combine. Processing constantly, slowly add the extra-virgin olive oil in a steady steam and process until the mixture forms a thick paste. Season with salt and pepper to taste. Scrape the pesto into a large bowl. Carefully pour about 1 cup of the soup into the pesto and stir vigorously to combine. Return the soup-pesto mixture to the remaining soup in the pot and stir to combine. Remove from the heat, cover and set aside to rest for 5 minutes. Taste and season accordingly. To serve, ladle the soup into individuals bowls and garnish with additional cheese. Per serving (based on 6 servings): 304 calories, 10 gm protein, 33 gm carbohydrates, 15 gm fat, 9 mg cholesterol, 4 gm saturated fat, 232 mg sodium, 4 gm dietary fiber. This simple, elegant appetizer makes a terrific starter for anything from a sit-down dinner to a backyard barbecue. Leaving the peel on the zucchini adds a touch of color to the dish. Using a mandoline, food processor or very sharp knife, cut the zucchini lengthwise into very thin slices. Arrange the slices, overlapping slightly, on a platter; set aside. In a small bowl, whisk together the lemon juice, oil and salt and pepper to taste. Drizzle the vinaigrette over the zucchini. Using a vegetable peeler, shave the cheese into think slices. Scatter the slices over the zucchini. Serve immediately. Per serving: 193 calories, 7 gm protein, 3 gm carbohydrates, 18 gm fat, 11 mg cholesterol, 5 gm saturated fat, 324 mg sodium, 1 gm dietary fiber. The combination of herbs accents but does not overwhelm the mild flavor of the zucchini. Preheat the oven to 4000 degrees. Cut the zucchini into 2 by 1/4-1/4-inch sticks (about the size of French fries. In a large skillet over medium heat, heat the oil. Add the zucchini and cook, stirring occasionally, until lightly browned, about 10 minutes. Add the garlic, parsley, basil, oregano and salt and pepper to taste and cook, stirring frequently, for 2 minutes. Remove from the head. Place the bread on a baking sheet. Pile the zucchini onto the bread and cover with 1 to 2 slices of cheese. Bake until the cheese melts, about 5 minutes. Serve immediately. Per bruschetta: 110 calories, 3 gm protein, 15 gm carbohydrates, 4 gm fat, 0 mg cholesterol, 1 gm saturated fat, 190 mg sodium, 2 gm dietary fiber. A tian, typically a Provencal-style gratin of various vegetables, doubles as a hearty side dish for grilled or roasted meats or as a light entrée when served with rice or couscous. Preheat the oven to 375 degrees. Oil the bottom and sides of a 13-by-9-by 2-inch baking dish. In a medium skillet over medium-low heat, heat 2 tablespoons of the oil. Add the onions and garlic and cook, stirring occasionally, until golden, about 12 minutes. Season the mixture with salt and pepper to taste. Spread the onion mixture evenly in the prepared dish. Sprinkle with 1/2 of the herbs. Arrange alternating slices of zucchini and tomato, slightly overlapping, on top of the herbs. Sprinkle with the remaining herbs and salt and pepper to taste. Drizzle with the remaining 2 tablespoons oil. Bake the tian until the zucchini is tender and the juices are sizzling, 40 to 45 minutes. Sprinkle with the cheese and bake for 5 minutes longer. Remove from the heat; set aside to rest for 10 minutes. Serve warm. Per serving: 151 calories, 6 gm protein, 11 gm carbohydrates, 10 gm fat, 7 mg cholesterol, 3 gm saturated fat, 233 mg sodium, 3 gm dietary fiber.